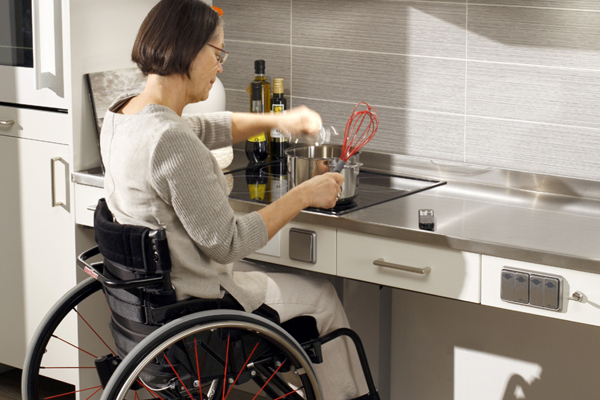 Top 5 things to consider when designing an accessible kitchen for wheelchair users. There are now more resources to help people stay in their homes living independently. Modifying an individuals home is one of the most important steps to assist someone in remaining in their home if they have physical limitations. One area of the home that is most important to accommodate is the kitchen. The goal of accommodating a kitchen is to create a barrier-free design to give access to all people whether abled or disabled. Some of these solutions are custom ordered items; however, some things can be accomplished by remodeling a kitchen a little differently. With all the advances in accessible design, a beautiful and efficient kitchen can be designed to be accessible for everyone that lives in a home whether or not they are disabled. 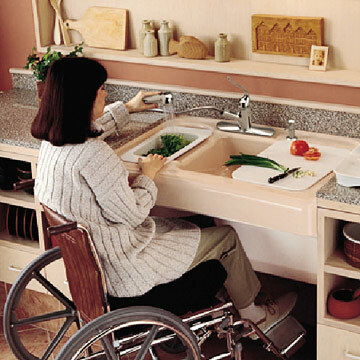 When designing a kitchen for people who use a wheelchair there are several things to consider for easy access. Kitchens require meticulous planning because every inch counts and appliances and cabinets come in fixed sizes and there may be limited usable space that limit what can be remodeled. Kitchen design has typically been based on the “work triangle” layout where the sink, fridge and stove have a short walking distance between them. 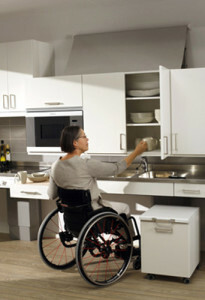 For an accessible kitchen, it’s ideal to have several work areas that can be accessed from a single position. 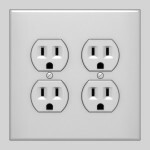 When space is limited choosing options may require a trade off of the most important accommodations. Designing or remodeling a kitchen requires balancing the requirements for storage (cabinets), workspace (counters) and appliances. When making a kitchen accessible you have to consider all of these things and put everything within reach. 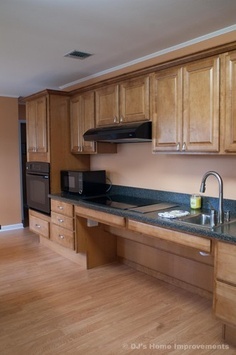 Typical countertops are positioned at a height of 36”. To make countertops accessible the work surface should be installed at a 34” height. Accessible counter workspace is 30” wide and countertops should be 28”-34” above the floor. Adjustable counters should have a range of 28” to 36” in height. Make sure countertop is not obstructed by base cabinets to allow for knee and toe clearance. If you are able to set the countertop height, this should be determined early in the design. The countertop will dictate location of storage cabinets and appliances. Ideally you would measure individual comfort ranges for working in the kitchen for whom the kitchen is being accommodated. Adjustable tables can be used before install or remodel to determine the ideal height to find dimensions that work for each member of the family. Often you need to use the space to see how it will best meet your needs prior to committing to a permanent design. Pull-out shelves coming out of the countertop is another good way to create easily accessible working space to prepare food. Sinks that have open space beneath the sink that provides wheelchair or walker accessibility will allow users to access the sink. Knee clearance for a sink needs to be at least 27” high, 8” deep at the knees or 11” deep for children. The drain should be placed in the rear of the sink so the piping underneath will not prevent a person in a wheelchair from rolling underneath. Pipes should be insulated or enclosed to protect legs from hot pipes. Set water heater to a maximum heat low enough that will prevent burning. Using a single lever faucet is a lower cost option to making the faucet accessible. There are also touch control faucets that allow the user to turn on and off the faucet with one touch. Also, installing the faucet to the side of the sink may make it more accessible for some people. Installing sliding drawers on both sides of the sink can provide easy storage of cleaning products or long rather than wide items. For lower cost option, cabinets can be lowered to meet individual users needs. Although more costly, electric powered adjustable cabinets, which lower and raise the cabinet height with a touch of a button allows the cabinets to become accessible to all users. Place often used items within reach such as spice rack and cutting boards. Use cabinet accessories that make the cabinets more accessible such as pull down shelves, adjustable shelves, drawer dividers, lazy susan cabinet, et cetera. Use looped cabinet pulls instead of knobs that are operable with a closed fist. With these you do not have to twist, grasp or use pinching motions. Put most used items in low drawers such as the dishes, pots/pans, glassware, et cetera. Other useful cabinet hardware may be: full extension drawers, touch-release drawers and doors, swing-up hardware that allow cabinet doors to hinge at top and stay open, et cetera. 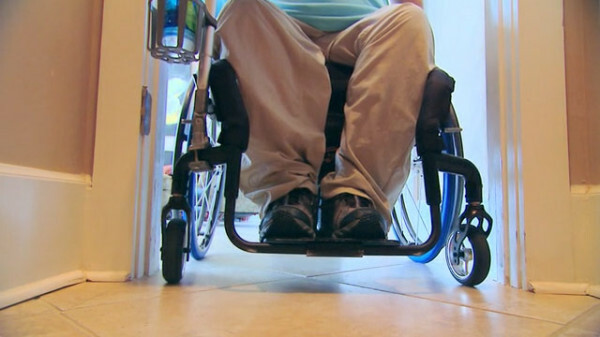 Installing a 36” wide door makes it accessible for a wheelchair or walker user. However, 42” width is more comfortable. Using a lever-style door handle makes it easier for them to be opened. Clearance for a pass through kitchen should be 40” wide. Clearance for a U-shaped kitchen needs to have a width of 60″. Electric cooktop with staggered burners with controls on the front will eliminate having to reach across hot burners. Raising the dishwasher 6” to 8” off the floor and making the dishwasher accessible from either side will increase access. Appliance controls with a maximum operating force of 5 lbs are standard accessibility requirements. 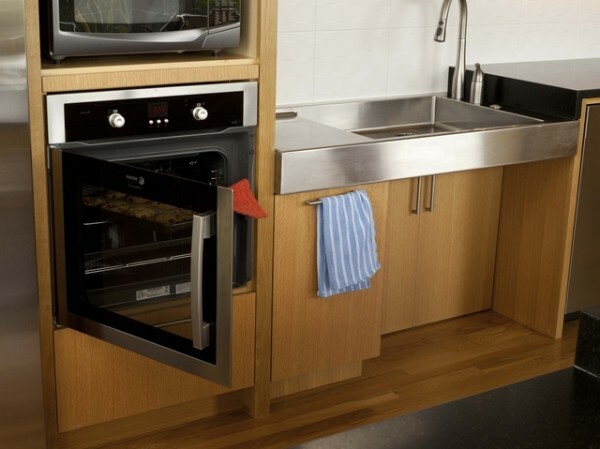 Side-hinged oven door which opens the door to the side will allow a seated cook to get closer to opening. Using a bottom-drawer freezer style refrigerator makes the freezer accessible. If you cannot visit a showroom to test out any of the appliances, find a supplier that will allow you to return the item if it is not a good fit. Consider which way you want the appliance doors to swing open and make sure you can access the appliance without contorting your body. 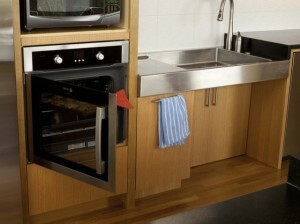 A cooktop separate from wall oven is best so they both can be installed at a comfortable height. Tactile controls such as raised buttons or dials with directional indicators that click into position at each setting can be used to increase safety. Appliances with touch pad operation are great for people who have limited finger strength and control. 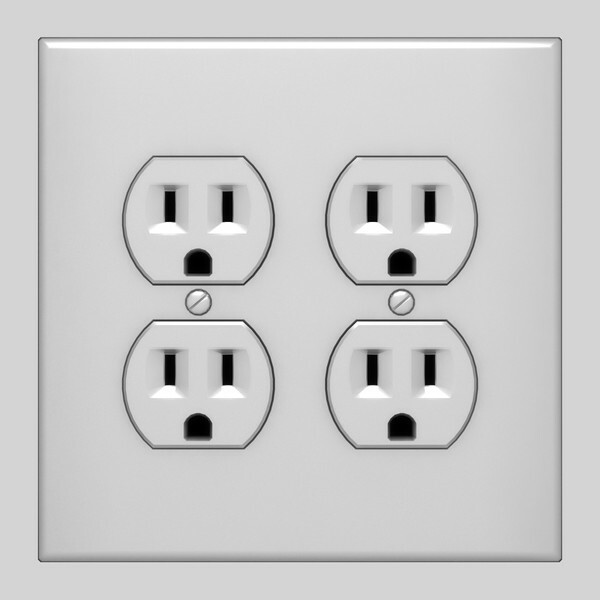 Placing electrical outlets lower, but no lower that 15”off the floor. Glare free lighting and good task lighting to increase visibility and create a safe cooking environment. Switches & thermostats installed no higher than 48” off the floor will make them accessible to wheelchair users. Creating several work areas in the kitchen can make it easier to access them from a single position. Suggestions for activity centers may be: baking area, salad counter, children’s snack area or a pass-through between garage and pantry for transferring groceries. Placing the lighting controls so you never have to navigate in the dark. If you can access the kitchen from multiple points, a multi-pole light switch allow you to turn on and off the kitchen lights when you enter or leave from either entrance/exit. Using a base cabinet on wheels can be used for transporting hot dishes from countertop to table or creating a moveable workspace area based on the needs of the activity. ATU158 – What will iOS8 mean for people with disabilities, Cole Galloway of Go Baby Go, Hey Siri, iOS keyboards and more!